Virgin Galactic's first SpaceShipTwo spacecraft, the VSS Enterprise, glides over California's Mojave Air and Space Port in this view from a series of unpowered flight tests. WASHINGTON — When suborbital adventure line Virgin Galactic launches the world’s first commercial passenger-carrying spaceflight service next year, the U.S. government will still be barred from policing most of the company’s activities. But federal safety officials here, eager to learn more about the private space companies they will soon regulate, have decided to open talks with industry in August. "We’re going to be setting up monthly public telephone calls to ask [industry] about certain topics," Pam Melroy, former NASA astronaut and senior technical adviser in the Federal Aviation Administration’s (FAA) Office of Commercial Space Transportation (AST), said in a July 16 interview. "We do plan on having these once a month for the foreseeable future. We really want maximum participation, and we want technical people to really help us understand what the thinking is out there." The first of these public calls is slated for the first week of August, Melroy said. Just to open talks with industry, the AST has had to navigate a legal labyrinth. The massive FAA reauthorization bill Congress passed in January bars AST from writing human spaceflight safety regulations until October 2015 unless there is a serious accident or mishap involving a commercial flight before then. But a report accompanying that legislation, the FAA Modernization and Reform Act of 2012, also noted that "nothing in this provision is intended to prohibit the FAA and industry stakeholders from entering into discussions intended to prepare the FAA for its role in appropriately regulating the commercial space flight industry when this provision expires." Further complicating things for Melroy and AST, the Administrative Procedures Act, longstanding federal law that governs the process by which federal agencies make rules for the industries they regulate, is very strict about when and how officials may share their thinking about future regulations. "Under the Administrative Procedures Act, we cannot discuss what a proposed regulation might look like, and so that kind of hinders us in talking to industry," Melroy said. So even as AST prepares to tap industry experts for their take on launch, flight and passenger safety, the office has set certain ground rules to avoid running afoul of the law. "We can’t propose anything, we can’t tell people what we think the answer is, or anything like that," Melroy said. "But we can tee up a subject and then let people talk to us, and that will help us understand if we’re on the right track or not." AST’s plan drew an enthusiastic response from the head of the Commercial Spaceflight Federation, a Washington trade group whose membership is stacked with entrepreneurial space companies such as Blue Origin, Space Exploration Technologies Corp. (SpaceX) and Virgin Galactic. "We enthusiastically welcome the dialogue that AST has initiated with the commercial spaceflight industry about a framework for discussing safety issues and sharing safety learning with and among industry," said Commercial Spaceflight Federation President Michael López-Alegría, also a former astronaut. He and Melroy flew together aboard the space shuttle Discovery on an October 2000 mission to the International Space Station. "We look forward to an active partnership to rapidly improve safety as we gain experience while avoiding imprudent regulation that could slow innovation and harm safety," López-Alegría added. James Muncy, an Alexandria, Va.-based space policy and legislative consultant who has lobbied on behalf of some of López-Alegría’s members and who pushed AST officials to begin a dialogue with industry right away, said the office’s approach "is proof that AST can creatively work with [industry] to advance safety much faster than bureaucratic paperwork can move in Washington. I’m glad we were able to help the Office of Commercial Space Transportation gain more flexibility to discuss key safety issues with our industry today, instead of fixating on when they can start writing formal regulations." 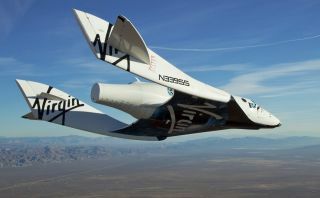 Although Virgin Galactic is expected to be the first company to fly passengers on a commercial basis, it is not expected to be the last. XCOR Aerospace of Mojave, Calif., said the week of July 9 that it plans to start launching suborbital spaceflights with its Lynx rocket plane as soon as the third quarter of 2013. The idea that astronaut taxis might also be used to carry private passengers has raised questions — and sometimes hackles — about which government agency, the FAA or NASA, would have jurisdiction over safety issues. That issue was at the heart of a memorandum of understanding that the FAA and NASA signed in June. The memo set out the roles of each agency in human spaceflight operations. Essentially, the FAA will continue to regulate the launch and re-entry of commercially operated spacecraft, as it has since 1989. That authority extends to NASA missions launched by commercial operators, according to the memo. However, NASA will be allowed to set safety standards for any spacecraft that carry astronauts or visit NASA destinations such as the space station. For flights that do not have a NASA component, the FAA will have complete jurisdiction — once the moratorium on issuing human spaceflight regulations ends. Whenever AST gets the go-ahead to begin a rulemaking process, Melroy said it could take a year or more before the office gathers the technical input it needs to write a rule. "Theoretically, we could issue a notice of proposed rulemaking after October 2015, and it would still be probably 2017 before we had anything that was in a final rule," Melroy said.